Are you thinking about going mobile, but not sure if you can get Technicians to login to a tablet and process their work? You're not alone. We heard lots of stories at SchoolDude University West about these concerns- but even better, we heard some great Maintenance leaders talk about how to overcome these concerns. One of the funnier anecdotes came from an Asst. Director that humorously called out members of the Maintenance staff that were grumbling about logging in. At the start of their weekly meeting on a Monday morning, she asked- "How did everyones' fantasy teams do this weekend?" Immediately almost all the technicians either started talking about the moves that made or broke their team, or they started pulling out smartphones to refresh their memory on how they did. "Look guys, she continued, if you can manage your fantasy football league, you can login to MaintenanceDirect to process your work!" And she's right- managing work in MaintenanceDirect is much less complex than most of the Fantasy Football leagues I've participated in. I mean waiver wires and trade deadlines have tripped me up way more than Status changes or entering parts and hours on a work order. 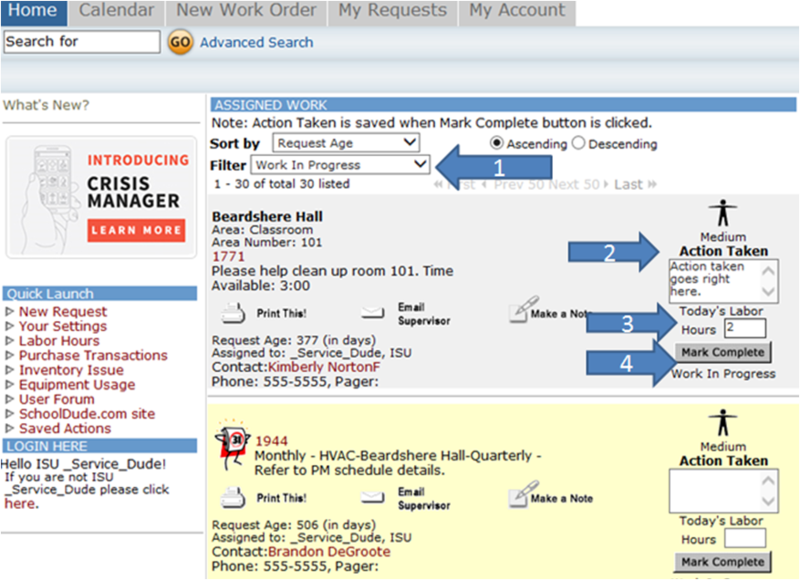 Take the Technician Home page- almost everything can be done to process work right there on the Assigned To dashboard. All of their Open Assigned work shows up on this page. The list can be filtered by status or sorted by age (1). The Action Taken field (2) lets them communicate what's been done to address this job. **Whatever is typed in that field is visible to the Requester. Hours can be entered (3) and Status can be changed to Work In Progress or Complete (4) from this screen as well. Want to see a help video that demonstrates a Technicians work flow? Click here to view. You'll see, it's as easy as making a lineup change when you find out your top RB is out with a high ankle sprain, 15 minutes before kickoff Sunday afternoon.